The future of the life settlement market has never looked brighter as the awareness of this $50 billion industry continues to grow. The purpose of this article is to educate you about life settlements and turn your interest into knowledge as you learn the ins and outs of an industry on the rise. While life settlements have been available for over 20 years, most people have never heard of the asset class. That's because over 95% of the industry is owned and controlled by major institutions such as hedge funds, institutional investors, and insurance companies. Odds are that if you are not familiar with life settlements, it’s because you're not an institutional investor. By definition, a life settlement is a purchase of an existing life insurance policy at a discount to its face amount. Let's use this simple example to illustrate how life settlements work. Larry is eighty-five years old. He owns a $5 million insurance policy and is paying $200,000 a year to keep it in force. Larry has outlived the usefulness of this policy and has three options. Larry decides to sell his life insurance policy since he'll receive three to four times his cash surrender value. This is the best option for Larry and his family. You may be thinking, what makes Larry selling his policy a legal transaction? In 1911, the Supreme Court ruled in a case called Grigsby versus Russell. This ruling enabled policyholders to sell their life insurance policy because it was deemed as their personal property just like a home or a car. So, who buys Larry's policy? Primarily, institutional investors as well as individual mid to high net worth accredited investors purchase life insurance policies. The purchaser now takes ownership of the policy and has the responsibility of paying Larry's premiums. Larry – who lived a great life – passes away at age 90. At that point, the investors received Larry's $5,000,000 death benefit. So, Larry was able to discreetly liquidate an asset receiving much more than the cash value in the policy, and the investors, who purchased his policy, received a sizeable return on their investment. The investors who invested $3,000,000 in this example have turned that into $5,000,000 in only five years. However, if Larry had lived longer, the investors would be required to pay additional premiums, reducing their overall return, but could still be profitable for many years. This is an example of purchasing one single policy, which is not all that common. In most cases, investors want to purchase multiple policies to increase their level of diversification. As you've seen here in Larry's example, there are two sides of the life settlement industry, the side that helps seniors sell their policy, which provides a huge win for the insured, and the side which creates an opportunity for investors to invest in an uncorrelated asset. The life settlement industry is a dynamic one. You may wonder how and when did this industry start? If we look back about 25 years to the early 1990's, the industry started with what was called viaticals. As you recall, back in the late eighties and early nineties, AIDS was starting to inflict millions of people. Unfortunately, for the victims and their families, it was the closest thing to a death sentence you were going to get. Those who contracted AIDS were typically younger and didn't have much of an estate but owned smaller life insurance policies. Their life expectancies were typically around two years because many were terminally ill. By selling their policy, it gave them a much-needed cash infusion, enabling them to be more comfortable in their remaining years. During the mid 1990's, the advent of new drugs treated the disease, prolonging the life of many of these insured. This made predicting life expectancies quite difficult, so by the mid-to-late nineties, viaticals had pretty much disappeared. Like most new asset classes, there were initial hurdles to overcome. One was and still is the lack of public awareness that a senior can actually sell their policy. As the industry grew back in the late 1990's and 2000's companies called life settlement providers became state licensed and acted in a similar fashion as title companies do in a real estate transaction. Closing policies with licensed providers became critical due to the high level of due diligence they perform to ensure policies would pay out to investors. Medical underwriting and servicing companies, like 21st Services and AVS, conduct premium optimization and ensure tracking grew rapidly due to the billions of dollars being invested into the life settlement market. Today, industry experts estimate that life settlement transactions represent a $50 billion industry. Still relatively small, but definitely on the rise as more seniors uncover the hidden wealth within their life insurance policies. As the awareness of senior selling their policies continue to grow, investing in these policies became more popular among mid to high net worth investors as a unique uncorrelated strategy not tied to stocks, bonds, real estate, or even geopolitical events. The uncorrelated nature of the investment is by far the number one reason investors are so attracted to life settlements. Many are surprised when they understand who the key players and institutions are within the life settlement industry. The biggest purchaser of life settlements are actually insurance companies. This doesn't make any sense, right? Or does it? Of course, the insurance companies know all too well how the strategy works, so they will buy their own policies, but they will buy other insurance company's policies to hedge against theirs being purchased. In fact, the Harvard Business Review reported that in 2012, AIG owned 50% of all life settlements in force within the industry. Other institutional investors include investment banks, hedge funds, pension funds, along with some recognizable names like Bill Gates and Warren Buffett. So, what are the key characteristics that draw institutions and individual investors to life settlements? As I mentioned earlier, investors appreciate the fact that their investment is completely 100% uncorrelated to stocks, bonds, mutual funds, interest rates, and geopolitical events. 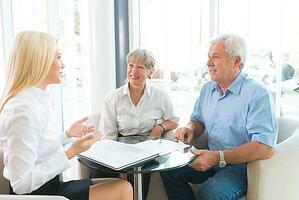 Life settlements are backed by top rated insurance companies. Most Americans own life insurance on themselves or a family member. When these policies are purchased, there's never a question whether or not the death benefit will pay out. This is because legal reserve life insurance companies always pay out their death claims. This characteristic alone makes life settlements a solid choice for qualified investors who understand and believe in life insurance. What Are Life Settlements Used For? Life settlements are a growth strategy designed to build long term retirement or legacy wealth. This strategy should not be treated as an income or a liquid short-term investment. There is a known payout on all policies purchased, eliminating the uncertainty many investments possess. For example, Larry's policy was purchased for $3,000,000 and the death benefit was $5,000,000, creating a $2,000,000 profit for investors. Typical minimum investments range from $50,000 to $5,000,000 depending on the structure. When investing in life settlements, it’s essential to work with well-established companies with a track record of client success and a high level of transparency is paramount. Utilizing conservative life expectancies, purchasing policies at a discount, and controlling fees on the front end is also a must. You should also work with a company that has a proven track record using experienced providers, servicing companies, and confirm that all money is held in escrow by licensed and bonded custodians. Don't hesitate to ask the company you're working with to show policy illustrations detailing estimated return on investment per year. Taking these steps will reduce risk exposure. Now that you've been educated on life settlements, and have learned many facts about the industry, please contact us to learn more. We can answer any additional questions and help determine if this strategy is right for you.